A Chinese company will begin shipping virtual reality glasses this week that weigh 4 ounces, considerably lighter than other VR offerings. 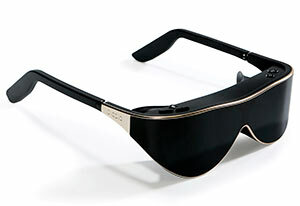 Dlodlo VR glasses, from a company of the same name, are priced at $699 and resemble a pair of sunglasses. As comparisons the Gear VR glasses from Samsung cost about $199 and require the use of a Samsung Galaxy Note 4 smartphone to be snapped into the headset to act as the display. The Oculus Rift DK2 weighs about 15.5 ounces. Dlodlo glasses provide 2K high-definition resolution with a 16:9 aspect ratio and a 120 Hz refresh rate. They support both 2D and 3D video, 4K video displays and a 110-degree field of view. The glasses don't require a PC or specific type of smartphone. However, they use the Android 4.4 operating system with built-in Bluetooth to connect with Bluetooth hardware, such as smartphones, tablets and laptops, speakers, headsets and gaming devices. They're powered by a 2000mAh rechargeable battery. "At Dlodlo, we've adopted an optical imaging system with perfectly combined optical technology and physical hardware using safe, skin-friendly material that's as light to wear as sunglasses," said CEO Li Gang. "Our VR glasses provide a distortion-free top quality 2K Full HD resolution display with biomimetic eye contrast ratio and definition design, so the user has a wonderful visual feast when using the Dlodlo VR Glasses."